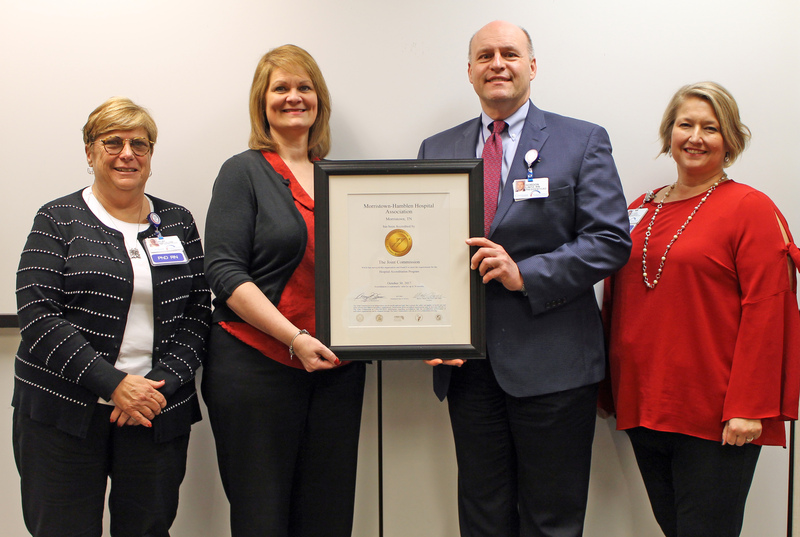 Morristown-Hamblen Healthcare System has earned The Joint Commission’s Gold Seal of Approval® for hospital accreditation by demonstrating continuous compliance with the organization’s performance standards. The Gold Seal of Approval® is a symbol of quality that reflects an organization’s commitment to providing safe and effective patient care. The designation represents a three-year renewal of accreditation for MHHS by The Joint Commission, which has accredited hospitals for more than 60 years. More than 4,000 general, children’s, long-term acute, psychiatric, rehabilitation and specialty hospitals currently maintain accreditation from The Joint Commission. In order to qualify for the designation, Morristown-Hamblen underwent a rigorous, unannounced onsite survey by The Joint Commission. During the review, a team of expert surveyors evaluated compliance with hospital standards related to several areas including emergency management, environment of care, infection prevention and control, leadership, and medication management. Surveyors also conducted onsite observations and interviews. The Joint Commission’s hospital standards are developed in consultation with health care experts and providers, measurement experts and patients. The standards are designed to help hospitals measure, assess and improve performance. Learn more about our quality improvement initiatives here.